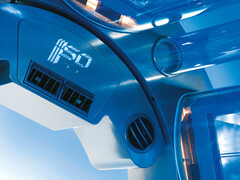 Tanning units and lamps designed and produced by ISO Italia are exclusive equipments made for beauty professionals. I.SO Italia allow to tanning and beauty centres, spa and solarium different models of tanning equipments like professionals tanning beds and vertical units, facial solarium and high and low pressure lamps. All the products are safe and efficient and have a unique design. Thanks to every kind of equipments quality, I.SO Italia was able to stand out as one of the most important company in the beauty sector. ISO Italia aims offer on the beauty market taning equipments able to give not only the perfect tan, but also a pleasant and revitalasing experience to the consumer. Solarium made by I.SO Italia are suitable for all skin types, designed for the best comfort and tanning and with a stylish and new design. 4 main tanning units lines that include 14 different models each with between one and three different variants of power. Interested to know more information about our tanning units? Contact us!